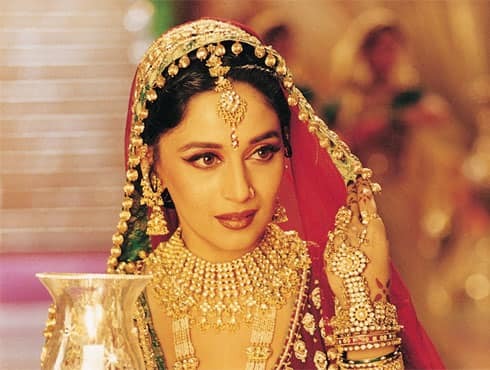 With Sanjay Leela Bhansali’s ‘Devdas’, Madhuri proved that married women could deliver hits in Bollywood. Reprising the character of Chandramukhi, Madhuri made a prostitute look pious. The film was a major hit at the Box Office. Her role in the film won her fifth Filmfare Award, but this time, in the Best Supporting Actress category. Madhuri gained more acclaim for her role in the film which dealt with gender inequality. The film was a multi starrer with stalwarts like Rekha and Manisha Koirala also part of the star cast but it was Madhuri who stole the limelight with her fiery portrayal of a nautanki wali . In Yash Raj’s ‘Dil To Pagal Hai’, Madhuri Dixit played the perfect girl next door who was wooed by her suitor (Shah Rukh Khan). With her stunning looks and impeccable dancing, the actress made her way into the hearts of the audience and deservedly won the Filmfare Best actress trophy that year. 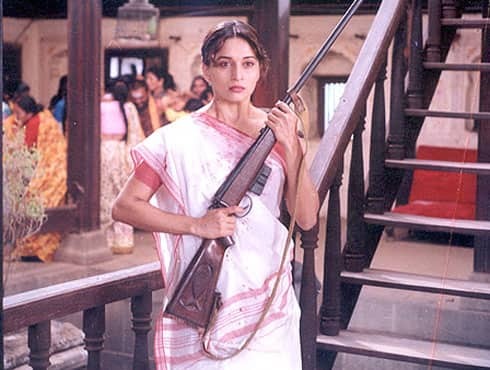 Madhuri made a bold move in her career by acting in Prakash Jha’s character driven film, ‘Mrityudand’. She made her mark in the off-beat genre and struck a chord with the women of the Indian heartland. Her role in the film won critical appreciation. Madhuri Dixit starrer ‘Hum Aapke Hain Kaun’ became the highest grossing Bollywood film after its release and held the record for 7 years. Madhuri Dixit won the Filmfare Award for Best Actress in a leading role. The song ‘Didi tera devar deewana’ picturised on Madhuri went on to become a cult song of Bollywood. Madhuri delivered another superhit with Sanjay Dutt in ‘Khalnayak’. Madhuri’s dance in the song ‘Choli ke Peeche’ became an instant classic although many frowned at its bold choreography and suggestive lyrics. After ‘Beta’ she was being called the Dhak Dhak girl of the industry. Madhuri teamed up with Anil Kapoor once again for the film. This role got her second Filmfare Award in the Best Actress category. 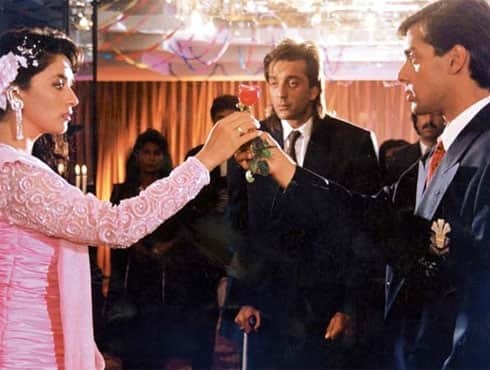 With ‘Saajan’, Madhuri went on share screen with the two most established actors of that time - Salman Khan and Sanjay Dutt. The actress won widespread appreciation for her role with the film emerging as the highest grossing Bollywood movie of the year. Sharing screen with Aamir Khan, Madhuri won her first Filmfare Best Actress Award for the film ‘Dil’. The film was a major hit, and the song khambe jaisi khadi hai topped the charts for weeks. Madhuri caught showman Subhash Ghai’s imagination and she was cast opposite Anil Kapoor in ‘Ram Lakhan’. Through this film, Madhuri proved that she is not just a great dancer but she can act too. Her role of Radha won rave reviews and her chemistry with Anil Kapoor rocked on-screen. Madhuri Dixit made her mark in Bollywood with her sensational dance in the film ‘Tezaab’. She won a nomination for the Best Actress at the Filmfare Awards. The film went on to christen Madhuri Dixit as the ‘Ek Do Teen’ girl of Bollywood.